counter-culture hosted by DJ Jason and the lovely Althea. Opening for the awards ceremony was the band Losing Venus, a quartet of morose rockers. The master of ceremonies was Voltaire, who started off with a solo medley of his satirical anti-folk songs, including the hilarious “Vampire Club” which debunks that sub-set of Goths who role-play at being vampires. Voltaire’s musical performance seamlessly led into an unrehearsed stand-up comedy act. As he announced each category, Voltaire maintained a good-natured, sarcastic attitude that kept us all laughing— even at ourselves! The honors highlighted the professionals in the NYC Goth scene with trophies and certificates, all in an atmosphere of mutual admiration. There was a panel of â”Celebrity” judges including some renowned DJs, former Miss Gothics and yours truly. There were a great number of categories —some serious, some intentionally silly— for DJs, club promoters, bars, bartenders, bouncers, and for musicians. Last, there was a fashion contest for the most stylishly groomed and attired. Top winners included Hal and his staff of Albion/Batcave who received a number of awards. 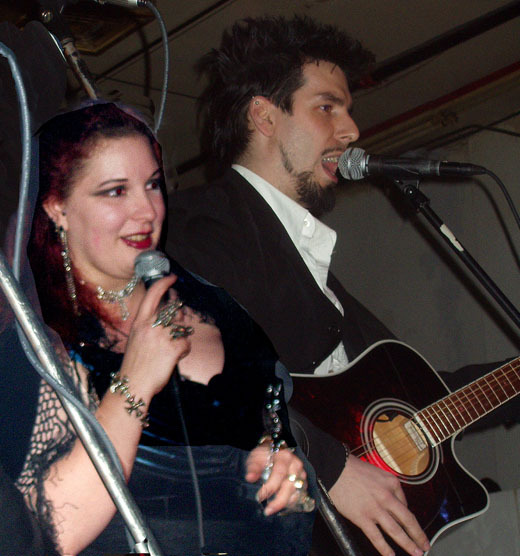 Lead vocalist Thera of Folk Fiction took the honors for number one Female Front of a Goth Band, and it was my distinct privilege to present the award for Best Front Man to NJ’s own Myke Hideous. Losing Venus was named Best New Goth Band. The awards themselves, whether serious or tongue-in-cheek, bestowed on each recipient long-overdue recognition for the frequently thankless efforts that each them have made over the years to create and support this underground community. It’s fascinating what a discrepancy exists between how sinister these people appear and how civilized and genteel they actually are. Despite the dental fangs, the chrome spikes and the ghoulish make-up, these are mainly well-behaved, talented and artistic kids. They may not have been most popular in school, but they have surely found acceptance in a community that celebrates creativity, nonconformity and every deviant form of personal style. Periodic events such as these enable Goths to express gratitude toward each other for mutually supporting their scene by faithfully coming out to their dance clubs and bars and patronizing the various establishments that cater to denizens of the dark NYC underground.